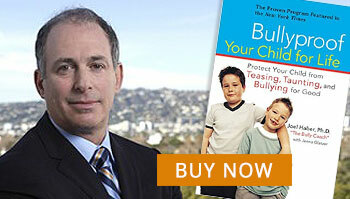 Dr. Joel Haber is the American Camp Association’s (ACA) official bullying consultant. He helped set the anticipated standard for anti-bullying prevention for all accredited summer camps that will take effect within ACA in 2012. He is a featured national speaker in the camping world, and has provided the web-based material on bullying for the ACA website. He is an ACA’s e-Institute expert on bullying, providing course material for Camp Staff and Leadership teams around the country, ensuring every camper feels safe and supported each summer. Dr. Haber also provides video and educational material for Expert Online Training on the topics of Relational Aggression, Cyberbullying and Sportsmanship. Click here to see what Expert Online Training is all about. As an additional resource, camps can purchase training DVD’s by Dr. Haber, published by Healthy Learning that can be found on this website covering many bullying topics. Please contact me if you have questions about these products. Each summer, Dr. Haber travels to camps and personally trained thousands of camp staff and leadership teams to reduce bullying issues. From before the summer starts, through final farewells—and even in the off-season the Respect U Camp Program helps camp personnel identify potential bullies in their staff or campers and “hot-spots” where bullying occurs. His program provides the specific tools needed to reduce bullying including: bunk pranks, hurtful gossip and relational aggression, sports bullying and on and off-season cyber-bullying. Results of his research on staff bullying have revealed how staff behavior plays an important role in creating a camp bullying culture. You can read more about this research in Camping Magazine as well as a series of articles on bullying used by camps for staff training each summer. For up to 250 counselors, staff, and administrators. For camps interested in follow-up on youth bullying progress, Dr. Haber offers additional on-site visits later in the summer and phone consultations with senior staff. Private, confidential consultations for senior staff are available during the camp season or prior to season kickoff training. The Respect U Camp Program is designed specifically for your summer camp and is targeted to resident camps, day camps, sports camps, specialty camps and teen program directors and staff. Children and staff are treated with respect, feel supported and have fun! Dr. Haber can train your team between the summer seasons, or meet with leadership teams to ensure that you are “Bully-proofed” before the summer begins.